Macy’s Downtown Dazzle is an event that my family has enjoyed for years. It’s a great excuse to come down to the heart of the city. It also has such a great sense of community and there are lots of free activities for the family to enjoy. I’m looking forward to bringing my family to this event again this year. It’s always fun to watch Santa repel down a building no matter how old you are. This year is the 10th Anniversary of Macy’s Downtown Dazzle at Fountain Square. Celebrate 10 years of Santa and his friends rappelling down the side of the 525 Vine Building to the Macy’s rooftop to kick off a spectacular fireworks display. 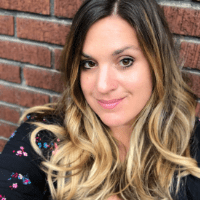 This 20-minute family-friendly program features performances from local choirs, new lighting effects, and a few surprises. 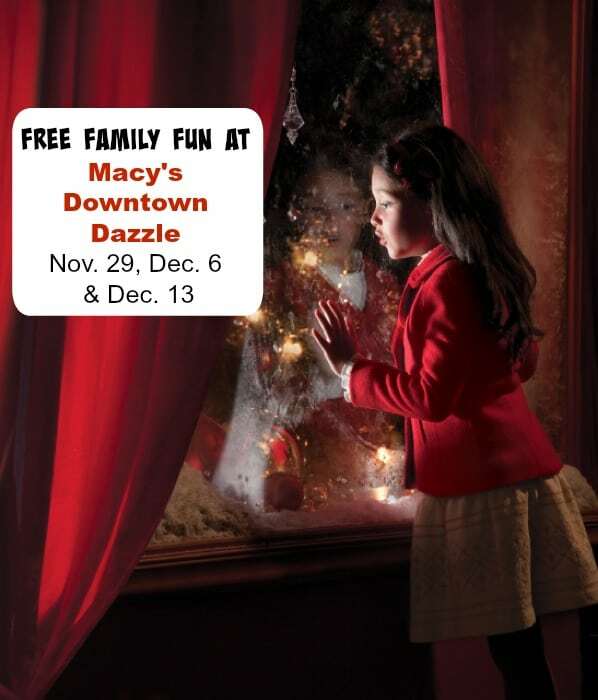 Then each week follow the Family Fun inside to Macy’s Fountain Place from 7-9 p.m! Available exclusively at Macy’s Fountain Place beginning Thursday, November 27 at 8 p.m., this commemorative ornament commissioned by Downtown Cincinnati Inc. and designed and created by the Rookwood Pottery Co. depicts the Genius of Water. Limited Supply.Stop by Macy’s on Friday, November 28 and Saturday, December 20 from 10 a.m. to 1 p.m. for exclusive Rookwood Tile Signings by artist Gary Simon, making your gift an heirloom to remember! and don’t miss out on the fun! 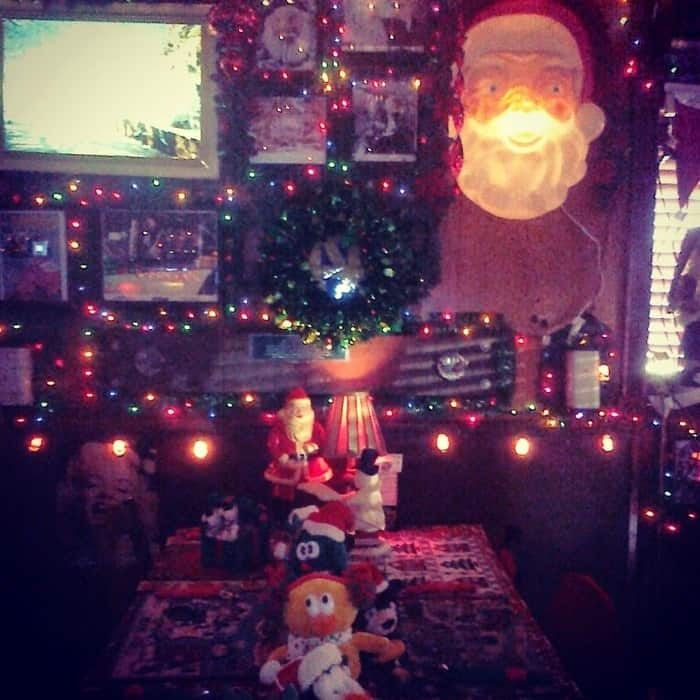 Recently, my family and I ate at a small corner restaurant and bar entirely covered in Christmas decor. 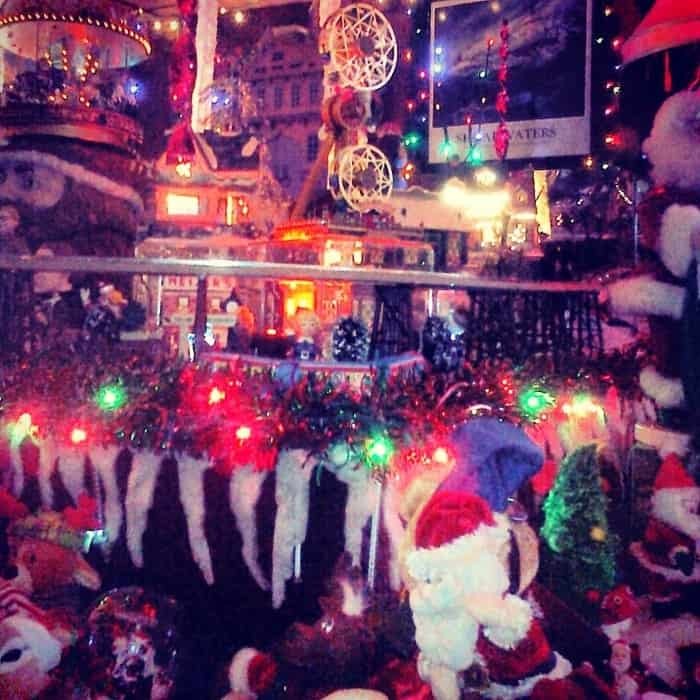 I found out about this little “Griswold delight” in an article from our local paper. It immediately piqued my curiosity and I wanted to see for myself this creation of a collector whose accumulation started at the age of 4. This labor of love begins after Halloween and stays up close to Valentine’s Day. The article shared that the owner was 4 years old when his parents got divorced and how he felt Christmas wasn’t as special as it should have been after that. This was his way of trying to get back lost Christmases. This is a place we normally would not have stopped at. It didn’t have the comfort or familiarity of a typical chain restaurant or popular tourist destination. 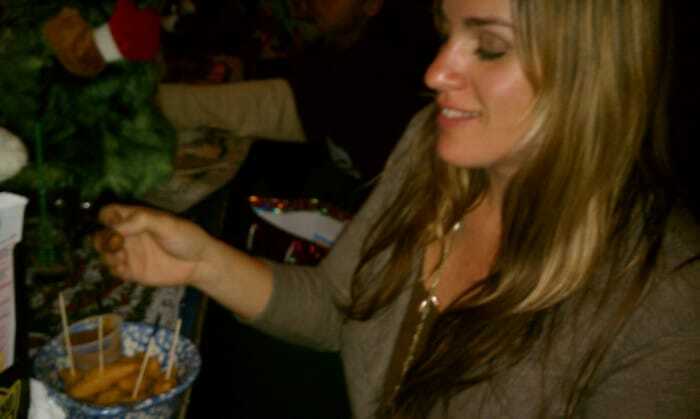 It also wasn’t in an area of town that I’ve eaten at a lot. Upon arrival we waited to be seated. The place was small and packed. Santa was taking pictures with kids and giving each of them a gift. My husband and I had stopped in earlier that week to make sure it would be a family friendly visit. We then found out about the visit with Santa prepared just for the kids. The workers had been prepping the kid’s gift bags earlier that week. There was a lot of thought and expense that went into each kids gift bag and I really appreciated that personal touch. Each child was also given a free kid’s meal of chicken nuggets, fries and a drink. While waiting for our food we played “I spy” as we took in all of the detailed decor around us. There was soooo much to see and discover in every direction. What was so impressive about this experience was the generous spirit of the owners and the workers. You could tell this was not a place that was “in it for the money”. The prices on the menu were low. There were no frills. 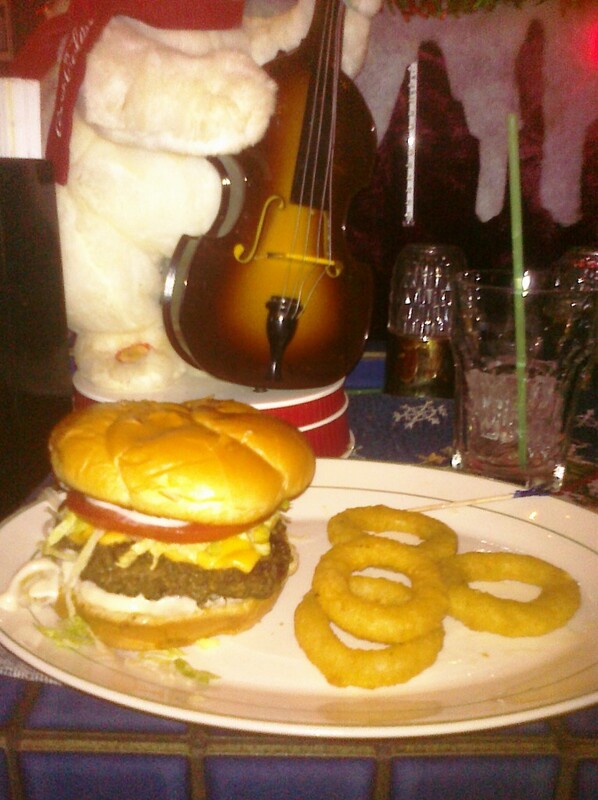 My husband and I enjoyed an olive burger with onion rings. If you go to Broadway Bar and Grill you must get the appetizer of fried apple slices with carmel dip for dessert. It’s like eating an apple pie. It was soooooo good! The atmosphere had a sense of community. Most of the workers seemed to know or be connected to many of the customers who were there. That’s what was so humbling that day. As we left we had been blessed by people who didn’t have a ton but demonstrated loving their community with what they had, in a way that worked for them. As we were paying our bill another worker brought out a huge bag of new hats and gloves to have the kids choose from. 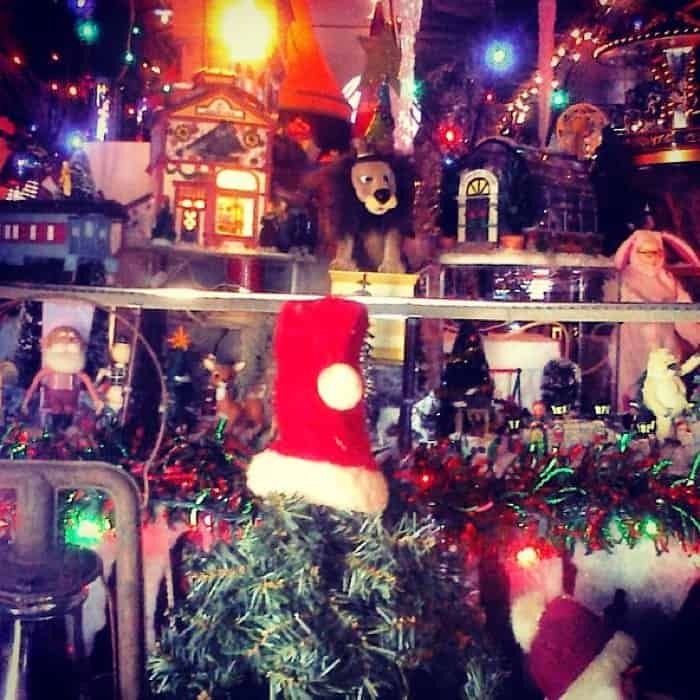 I’m glad our family found some Christmas cheer in an unexpected location. I encourage you to seek to find a small gem in your community. 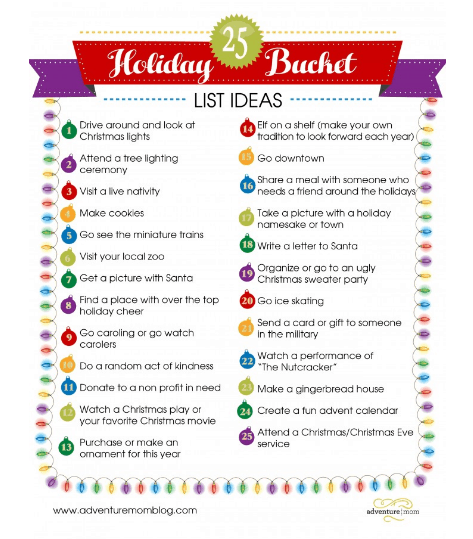 I would love to hear stories of where you have found local holiday cheer near you. 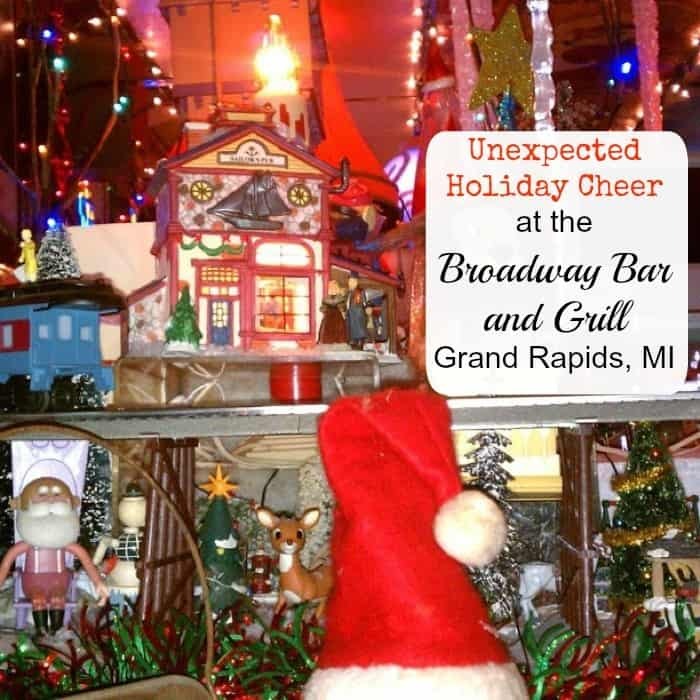 If you live in Grand Rapids check out Broadway Bar and Grill. Bring your kids on Sunday, December 18th for a gift, picture with Santa and free kids meals from 2-4.